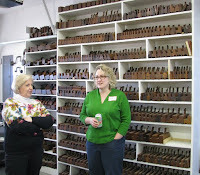 A friend of mine hosted a holiday party this past weekend for woodworkers and their spouses/partners. 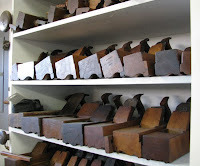 My friend has the largest collection of handplanes, plumb bobs, and gimlets & corkscrews I have ever seen. His shop is a veritable museum. And of course, that's where we woodworkers congregated for most of the afternoon. An occasional trip to the food table in order to keep our energy up while we flapped our jaws about al l things woodworking was the only deviation from the treasure trove of tools that is my friend's shop. He has been collecting tools since handplanes could be had at yard sales for a pittance and he's a walking encyclopedia of information concerning them. I snapped a bunch of photos during the party and discovered upon review that the only ones that contained people were of two ladies who were standing in front of the wall o' planes. I think they thought I was taking their picture and I didn't have the heart to ask them to move aside. I suppose the Christmas spirit must have gotten hold of me. Dang it.